Every summer I look forward to the fresh strawberries that are sold at the tiny fruit stand near our house. They come every morning for a month or two, or as long as the berries are in season. They sell strawberries and raspberries, and they are the best berries you have ever tasted. They are so sweet and juicy, it is really hard get them home without eating them in the car. I usually have to go without my children, otherwise they are finished. A friend of mine came to stay with us for the week – and on her way south, she stopped at one of the stands that sells the berries fresh from the farm – she brought an entire flat of strawberries, raspberries and blueberries. I immediately had her put them in the basement refrigerator so the kids wouldn’t see them. The strawberries looked so ridiculously delicious, there was only one thing to do – make shortcakes. I saw this recipe in Bon Appetit, and it looked like a delicious shortcake recipe – made with buttermilk instead of cream. These biscuits were outrageous. Crispy on the outside, yet tender and fluffy on the inside. I made smaller biscuits, so I made a lot of them – and they were delicious the next morning warmed slightly in the microwave with a drizzle of honey. Even though the berries were the showcase, the shortcakes definitely gave them a run for the money. A perfect summertime treat. Preheat oven to 400°F. Line baking sheet with parchment paper. Whisk first 4 ingredients in large bowl. Add butter. Cut in until coarse meal forms. Whisk 1/2 cup cream, 1 egg, and extracts in small bowl; mix into dry ingredients. Gradually add buttermilk; toss until moist clumps form. 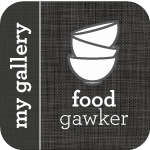 Gather dough into ball; flatten into disk. Press dough out on floured surface to 9-inch round. Cut out 2 1/2-inch-diameter rounds. Gather scraps and repeat, cutting total of 12 rounds. Place on prepared sheet. Whisk 1 egg and 2 tablespoons cream in small bowl for glaze. Brush some on rounds. 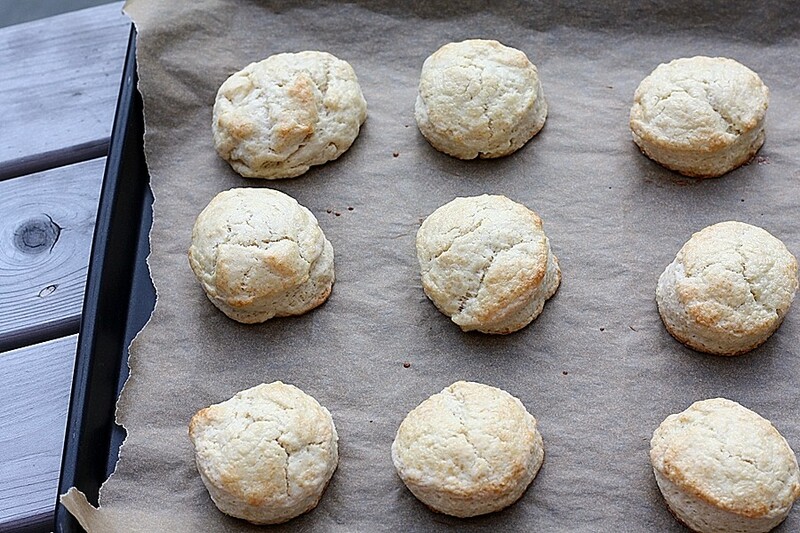 Bake biscuits until golden and tester inserted into center comes out clean, about 18 minutes. Transfer to rack and cool. Beat cream, powdered sugar, and vanilla in large bowl until peaks form. Toss berries and 3 tablespoons sugar in another large bowl; let stand until juices form. Halve biscuits. Place bottoms in bowls. Top with berries, then cream and tops. I just love strawberry shortcake. 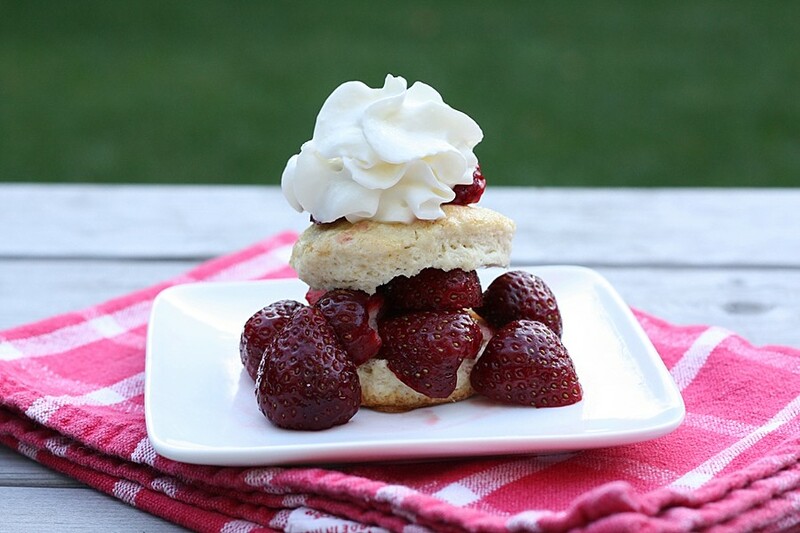 These biscuits are the perfect backdrop for those sweet berries and cream. looks amazing! next strawberry recipe I try will be this one!